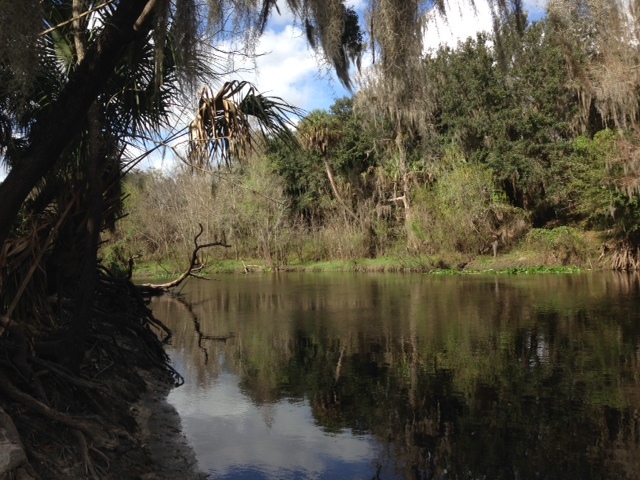 We visited Deleon Springs State Park in Volusia county on Saturday and it was crowded! This park has a renowned Pancake House Restaurant, and I think everyone in the state of Florida decided to go out for pancakes that morning! The park has a spring that has a concrete walkway that partitions off the spring from the creek that connects to it. Many people come to either scuba dive the spring, or watch for manatees. Surprisingly, there were very few Manatees for a cool January morning. The only area I could really fish was around the docks that the paddle boats are located, and another dock that is for fishing or viewing. I noticed that the bank to the right of the dock had high water forming a marshy area. Some flow was coming out of the marsh very slowly, which was either tidal, or runoff from the marshy area due to all the rain we were having. After about my fifth cast I had a bite on my trick worm. A few more cast later I set the hook on a fish and my line broke! I should have re-tied that morning, but forgot….. I composed myself, and fished for another 30 minutes without a bite. 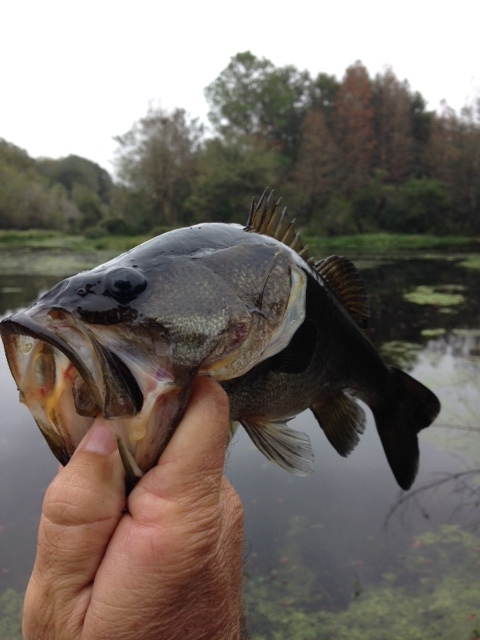 I was beginning to think I lost my opportunity when I saw a bass break near the marshy area. I made a cast and had a pick up. I set the hook and caught this 14″ bass. I had a second one strike and lost him when he jumped out of the water. That was it for the day as I wore out the area I had to fish, but still a little action and 4 bites in an hour and a half is still not bad. Take a day trip to Deleon Springs when you get a chance, and even if you do not fish, or scuba dive, you can still get a mean stack of pancakes! This entry was posted in Uncategorized on January 20, 2015 by shurstrike. On New Years weekend, Sharon and I visited two parks south of Lakeland as we made our way south to my parent’s winter home in Lake Placid Florida. 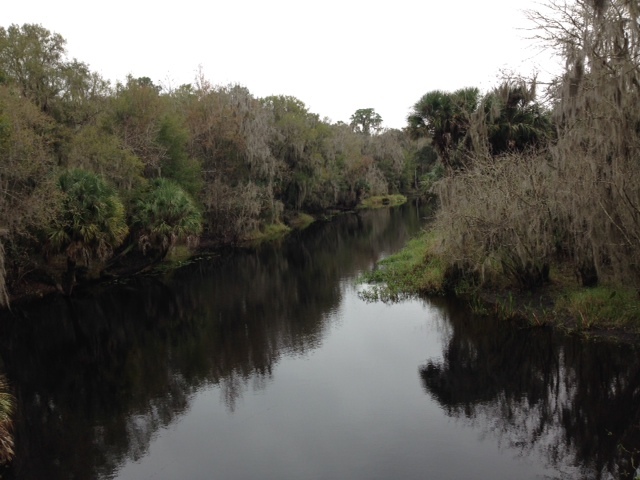 On the way down, we stopped at Alafia River State Park, near the town of Picnic Florida. Have you ever been to Picnic? 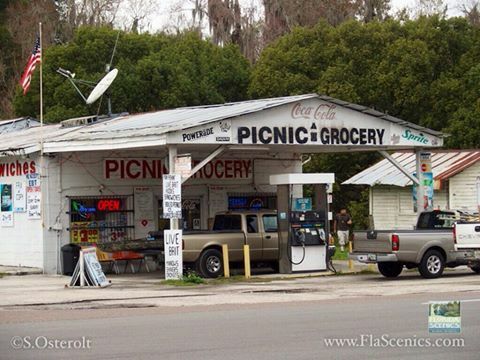 If you make your way down 17, and in-between Mosaic mine land, there is a general store in Picnic, and that’s about it. I fished at the Alafia State park which is a misnomer. It really isn’t on the river……. It is mostly trails for cyclist through old mined area that the sandmine companies turned back to the state. It is actually a tribute to the fact that you can mine areas in Florida, and bring them back to natural beauty if they are treated correctly. They do have some lakes, and they are actually very nice and natural after mother nature took control several years ago. I caught one fish on a Zoom Super Fluke, but that was it. Here is a picture of the fish and the area I was fishing. On the way back from our visit, we stopped at Payne’s Creek State Park. This is a beautiful park that has trails that go along the creek and end up where Payne’s Creek meets the Peach River. I thought this was a perfect spot to fish and catch a bass or two….. 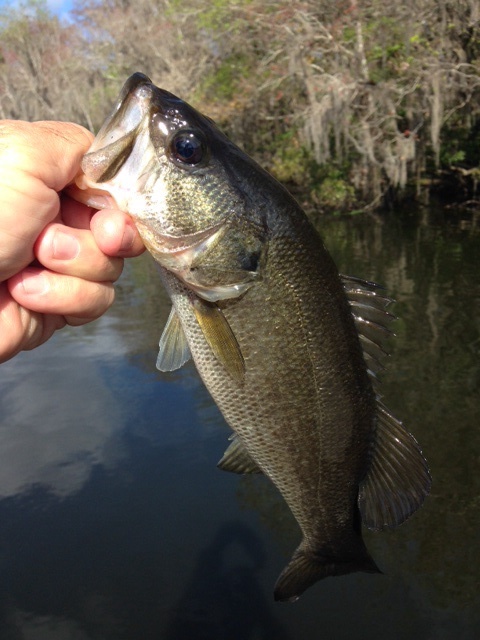 There were many bass moving into the creek from the river that I could see in the clear water, so I pitched my finesse worm to them in the shaded area of the creek mouth. I had two bites there, but nothing that held on long enough for me to set the hook on them. I also got a bite in the Peace River, but my line broke right at the knot! Ouch! I hate when that happens, and I had to take a Zero for the day. Here is a picture of the Peace River where Payne’s Creek meets up with it. This entry was posted in Uncategorized on January 9, 2015 by shurstrike.